Preston Grasshoppers make the first of this season’s five trips to Yorkshire on Saturday when they renew acquaintance with Huddersfield. The clubs last met in the 2015/16 campaign when Hoppers did the double – 32-6 away, 57-17 at home – as the White Rose side headed for relegation. Now, after ups and downs for both sides, they are reunited in National League Two North, where Huddersfield finished sixth last April. The Yorkshiremen have started with two defeats, but picked up a losing bonus point in both, to sit 12th in the table, two places below Preston, who have won one and lost one. He has a couple of fitness checks to make before choosing from a squad which includes dual-registered Sale Sharks players Reuben Birch and Teddy Leatherbarrow. The back-five forwards have trained with the club all summer. 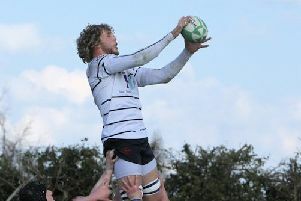 Hoppers’ 2nd XV contains a number of players making their way back from injury. Meanwhile, Fylde return to Ansdell to take on next-to-bottom Macclesfield, who have a solitary losing bonus point after two defeats. So far Fylde’s one victory out of two, plus two bonus points, puts them in sixth place. Vale of Lune’s tough start to life in the North Premier League will not get any easier this weekend as they head up the M6 to Kendal. The Cumbrians have kicked off with two away games, winning one of them to sit 10th. Vale’s two defeats, without even a bonus point, leave them rock bottom. Fergus Owens and Ben Dorrington return at centre for the visitors, with Will Hunt switching to fly-half. Callum Kyle, formerly of Blackburn, starts in the back-row after being a replacement last week and there will be a late choice between Dan Rainford and Adam Foxcroft at lock. Hoppers (from): Jordan; Spence, Stott, Fitzpatrick, Trueman, Ward, Davidson, Gough; Mabaya, Millea, Altham, Wilkinson, Howard, Procter, Birch, Arnold, Murray, Trippier, Leatherbarrow, Lamprey. Vale: J Dorrington; Jacques, Owens, B Dorrington, Ramwell; Hunt, Swarbrick; Bradshaw, Powers, Pillow, Rainford (or Foxcroft), Fellows, Kyle, Ayrton, Robinson. Replacements: Tagg (or Smith), J Wallbank, Lomas.